Do your contact lenses sometimes feel uncomfortable at the end of the day? Or, have they recently started to feel less comfortable than they once did? If so, there may be a very straight-forward reason for your discomfort. And, better still, there’s a simple fix. What’s the Lifespan of Your Lenses? Be honest: do you always replace your lenses according to the prescribed schedule? If not, you’re in the majority. In fact, in one recent study, 67% of participants wore their lenses for longer than manufacturers recommended they should. But just because lots of people are doing it doesn’t mean it’s in your best interest to follow suit. So why is it so important to toss your worn lenses on schedule? Over time, your lenses undergo changes that you can’t yet see but they can have meaningful consequences, particularly with regard to comfort. Contact lenses contain small pores that allow oxygen and nutrients to reach your cornea. But over time, these pores fill with proteins and other debris. You can wash most of this off every night, but over time it starts to build up, while the contact lens itself starts to break down. The result is limited oxygen permeability and a buildup of unhealthy materials. Extensive research shows that the use of contact lenses past the scheduled replacement date is associated with inferior performance with respect to comfort and vision. Indeed, comfort declines and complaints of dryness increase with longer periods of wear. On the flip side, many studies have reported that improved comfort is linked with increasing lens replacement frequency. Your doctor and his or her staff probably spent a lot of time discussing proper lens replacement with you. The recommendation you were given with regard to the lifespan of your lenses is based on solid clinical science. So, whatever lenses you wear, it’s important to follow replacement guidelines. If you’re not sure what they are, call your doctor and ask. Overextending the life of your lenses is never worthwhile, whereas the benefits you’ll experience when you put on a fresh pair will remind you of why you chose contact lenses in the first place. Doctors and lens manufacturers have been working together to develop ways to keep you comfortable in contact lenses. Their combined research and clinical experience has revealed that one of the best ways to maintain healthy lens wear is to offer lenses in annual supply packs only, thereby making it easier for patients to comply with replacement schedule recommendations. Research shows that patients who purchase an annual supply of contact lenses are more likely to replace their lenses on schedule, which results in healthier eyes. This is why SynergEyes has instituted an “Annual Supply” program to help lens wearers remember to replace their contact lenses on schedule, thereby maintaining the comfort and vision they expect from their lenses. 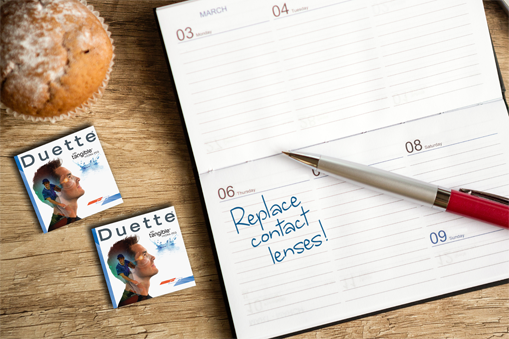 By replacing contact lenses on schedule, the likelihood of discomfort is reduced. Sometimes the doctor or staff’s suggestion can seem like a high-pressure sales pitch, but this is rarely the doctor’s intent. Most doctors truly believe in the value and benefit of replacing a lens on schedule and know that an annual supply purchase increases the likelihood that you will change your lenses regularly since you have the lenses you need on hand for the whole year. When you run out, it’s time for your yearly exam to make sure your eyes are in good health. An annual supply also saves you shipping charges or extra trips to the doctor’s office to pick up fresh lenses. You and your doctor are on the same team. You want to be comfortable and your doctor wants you to be healthy and happy. One of the best ways to achieve all of this and more is to see your doctor every year, opt for an annual supply, and always replace your lenses on time. Dumbleton KA, Woods CA, Jones LW, Fonn D. The relationship between compliance with lens replacement and contact lens-related problems in silicone hydrogel wearers. Cont Lens Anterior Eye. 2011 Oct;34(5):216-22. Jones L, Brennan NA, Gonzalez-Meijome J, et al. The TFOS International Workshop on Contact Lens Discomfort: report of the contact lens materials, design, and care subcommittee. Invest Ophthalmol Vis Sci. 2013;54:37-70. Dumbleton K, Richter D, Bergenske P, Jones LW. Compliance with lens replacement and the interval between eye examinations. Optom Vis Sci. 2013 Apr;90(4):351-8.